Would Hillary Take Away Your Guns in an Emergency? Yes. Imagine and emergency situation where the social order has broken down and chaos reigns. Imagine a time when the police cannot protect you or your family. Imagine, as L.A. Times blogger Tim Cavanaugh invites us to imagine, the next Hurricane Katrina. In such a situation, law abiding gun owners have the ability to lawfully protect themselves. But if Hillary Clinton had her way, the government could take citizens' weapons in such situations. In 2006, she voted against a measure in the Senate that prohibited confiscation of legal firearms during emergencies and major disasters. Luckily, 84 senators (including, to their credit, John McCain and Barak Obama) voted for and passed the legislation. The Second Amendment to the U.S. Constitution protects the rights of the people to keep and bear arms. That right is fundamental to liberty. The founding fathers had emergencies and disasters in mind when they legally protected your ability and my ability to defend ourselves, our families and our freedom. Be wary of any politician who would vote to limit your Second Amendment rights and confiscate legal guns in an emergency. A scandal is brewing around presidential candidate Barak Obama, according to Charles Jaco of KTVI. Tonight, he reported on questions raised around Obama's purchase of his Chicago mansion in 2005 for $1.65 million. Apparently, the purchase price was about $300,000 less than the asking price and the sale commenced on the same day as the wife of a political supporter bought the vacant lot next door for $650,000. Jaco's report states that there is a suspicion that the supporter's wife overpaid for the vacant lot so that Obama could get his mansion at a discount. Questions about this land deal are surfacing now because the political supporter referenced is Tony Rezko, whose unrelated corruption trial (which involves another Illinois Democrat, governor Rod Blagojevich) begins in Chicago on Monday. Jaco's report draws on (and cites) an article from Tuesday's Times of London. This article raises even more serious questions about Obama. It reports that Rezko received a loan from a British-Iraqi billionaire named Nadhmi Auchi (who has already been convicted of corruption in France) shortly before the Obama real estate transaction. The Times questions whether or not Auchi was really the one helping Obama buy his mansion. While not going into specifics, "Obama now admits his involvement in the land deal was a 'boneheaded mistake.'" Corruption usually is a mistake, even if it has been the norm in Illinois over the years. The whole story reeks of a corrupt wealthy foreigner buying influence with an up-and-coming American politician . . . one who is now on the verge of the Democrat's presidential nomination. If Barak Obama is capable of making such a "boneheaded mistake" and allowing himself to be involved in a deal as suspicious as this one, can the country really trust him in the Oval Office? Red light cameras are springing up everywhere. And they're unconstitutional. Most municipalities red light camera schemes work like this . 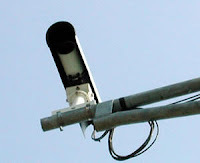 . . the cameras are installed by vendors "free of charge" at various intersections. The cameras snap photographs of vehicles that violate red lights and then the registered owner of the vehicle is mailed a ticket. Whether the owner of the vehicle was actually driving at the time of the violation, however, is unknown. The photographs don't show the driver. When the tickets are paid, the City gets a cut and the vendor gets a cut. Everybody's happy and all involved get to claim, rightly or wrongly, that they're making the world a safer place. But what happens if the owner of the vehicle had loaned it to somebody else? Well, the owner still gets the ticket and has to pay it unless he or she testifies about who was driving. And that's where a violation of the Fifth Amendment comes in. Under these red light camera schemes, the accused vehicle owner is presumed guilty of the violation and required testify to prove his innocence. But the Fifth Amendment guarantees that "no person . . . shall be compelled in any criminal case to be a witness against himself." In a conversation with a local prosecutor several months ago, the prosecutor admitted to knowing that these schemes were unconstitutional. The municipalities and the camera vendors, however, banked (literally) on citizens not knowing their rights or, if they did, not wanting to spend more on legal fees than the fine itself. If prosecutors in Arnold, Missouri, felt the same way, they didn't know Chet Pleban. Pleban is a local attorney whose friends must even admit there's never been a media outlet that he didn't like. His name crops up from time to time in various newsworthy cases. Whether for the publicity or the principle, Pleban has filed suit on behalf of two Arnold residents who received a ticket in the mail. More power to him. In this case, he and his clients are right on the money. Today conservatives in America suffered a great loss. William F. Buckley, Jr., died at the age of 82. Buckley's impact on conservative philosophy in America cannot be overstated. Buckley founded National Review in 1955. Through that seminal magazine and his television program, Firing Line, Buckley brought conservative ideas to the country backed by his intellect, logic, and wit. He attacked liberals on principle not on personality. Without Buckley, there might not have been a Barry Goldwater or a Ronald Reagan. I had the pleasure of meeting Mr. Buckley once in 1988, when he came to speak on campus at the university I attended. A northeastern intellectual, he seemed a bit out of place amid the farms of northeast Missouri. But Buckley was comfortable and on his game. After his prepared remarks, the floor was opened to questions. A liberal student asked Buckley about some environmental issue and how it was destroying the planet. Rather than stating simply (and boringly) that he felt that the issue was minor compared to the size, complexity and resilience of the planet, Buckley put it this way . . . "if a child pees in the headwaters of the Missouri River, I do not think that it should be cause for concern." He made his point and I've never forgotten how he did it. Buckley was the father of modern conservative thought. His voice will be missed. To a great man, rest in peace. 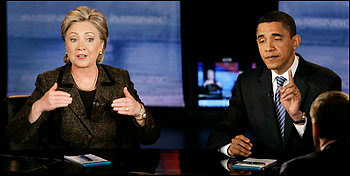 This evening in Cleveland, Hillary Clinton and Barak Obama bashed and criticized one another in their final debate before Tuesday's primaries in Texas and Ohio. To each of them I say, "thank you." The longer that they fight each other and the more warts we see on each of them, the better. I had a lot of windshield time and listened to some of Rush Limbaugh's show on KMOX. He's asking Republicans to cross over and vote for Hillary in the upcoming primaries, just to keep this contentious race going. He's got the right idea. As Abraham Lincoln said in another context, "a house divided against itself cannot stand." If Hillary and Obama keep attacking each other, maybe their political house will come crashing down. It could be great fun to see the Democrats in chaos. It might seem odd to see an avowed conservative blogger praising a big government project, but here I'm doing it. For years, Missouri and Illinois have been squabbling over funding of a necessary new bridge over the Mississippi downtown. According to the St. Louis Post-Dispatch, the squabbling is finally over. As a conservative, I'm not anti-government or anti-government spending. I'm just against the government taking my money and spending it on pork and using it to drive their way into what should be private matters. But there are things that are properly in the realm of government . . . police departments, fire departments, military and foreign affairs come quickly to mind. Roads and bridges do too. With the growth of Illinois suburbs and increased traffic over the Poplar Street Bridge, this new bridge has been needed for years. It is good to see that the politicians have finally figured out how to get something done. 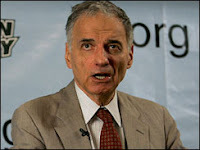 Ralph Nader announced today that he's running for president . . . again. Don Quixote has nothing on old Ralph. Nader is willing to tilt at a few more windmills and run another futile, losing campaign. I'm just not sure why. Is he an egomaniac? That's possible. I've never been a press darling (though I should be) but Nader has. Maybe media attention is as addictive as crack cocaine and Ralph is an attention junkie. Or is he delusional? If he's running and thinking that he's going to win (or even come close) then certainly he is delusional. Not because of the strength of the other candidates but because of the inherent impossibility of a third party candidate winning at this point in American history. Is he running to help John McCain? Crazy as it may seem, it could be true. One would expect more of Nader's votes to be pulled from the Democrat's rather than the Republican's column. At 73, he's also older than McCain (72) and could unwittingly (?) diffuse the age issue. McCain is no conservative so maybe he's palatable to Ralph. Or is conventional wisdom wrong because McCain is not conservative? Since McCain based his primary strategy on gathering votes from Democrats, will those Democrats who genuinely object to their party's eventual nominee now have another place to turn. I'm not sure about Ralph Nader's motives but his candidacy is likely to make things more interesting. And I'm all for that. New York Times Now Slams McCain. Surprised? Today the "venerable and respected" New York Times hit John McCain with a front page story questioning his integrity and all but accusing him of handing out political favors to a female lobbyist that he was sleeping with. This particular hit piece was apparently in the works for months and the scandal is eight years old. So why is it news now and not months ago? It is news to the Times only now because McCain has only recently knocked out his conservative opponents and wrapped up the Republican nomination for president. When McCain was running against conservative contenders in the GOP primaries he counted on the help of big media (like the New York Times) and liberal Democrats (like the staff at the New York Times) to push him over the top. Don't forget that the Times endorsed McCain in January. While McCain was running against real Republicans, he was the liberal media's choice. Now that he's ready to run against a Democrat, big media has turned on him. If anybody is surprised by that, they shouldn't be. They should just be reading this blog. Just take a look at the first story that I ever posted here, "Super Tuesday or Super Tragedy?" To quote myself, "his friends in the media aren't going to support him over Hillary Clinton or Barak Obama." Too bad that Republican primary voters didn't see this coming. John McCain sold his soul to the left to secure this nomination. He gathered support and votes from institutions and voters who never wanted him to win the presidency, just the nomination. And those folks accomplished their goal . . . there is no viable conservative left in the run for the White House. If McCain's goal was to win the nomination so that it would look good in his obituary, he met his goal too. On the other hand, if his goal was to actually be president, his courting of liberals and "moderates" was a huge mistake. Fraud in the Democrats' Primary, Surprised? Apparently, the Clinton machine is gung ho in New York. Amazingly, in the Democrats' recent primary election, not a single vote for Hillary Clinton's rival, Barak Obama, was counted in 78 different districts. New York City Mayor Michael Bloomberg called it fraud. And he's right on the money. But is anybody really surprised that a Clinton campaign would resort to fraud? And we all thought that machine politics died with Tom Pendergast. Former Missouri Tiger running back Brock Olivo has announced that he is running for congress in the district Kenny Hulshof serves now. Hulshof is vacating the seat to run for governor. Is Brock a conservative? I have no idea. But this is Missouri, Brock, so you'll need to show me. February 25, 2008, Update: Brock Olivo might not know if he's a conservative either. What he does know, and now the rest of us do too, is that he's never bothered to cast a vote in his life. This morning I heard a very interesting interview with Professor John Lott from the University of Maryland on KMOX Radio's Charlie Brennan Show. Professor Lott makes a very convincing argument that shooting incidents like the one last week in Kirkwood and yesterday at Northern Illinois University are more likely in a gun control society like ours, where licensed citizens are prohibited from carrying concealed weapons in many public places. His argument is made in detail in his book, More Guns, Less Crime: Understanding Crime and Gun Control Laws. Lott contends that by gathering together in gun free zones, Americans are making them sitting ducks for madmen with guns. The madmen, of course, don't seem to be swayed the sign on the door that says guns are prohibited. The victims, however, don't have guns and aren't able to defend themselves. It is definitely food for thought. As is the Second Amendment to the United States Constitution. Today, as one would expect, the St. Louis Post-Dispatch carried an article about the campus rampage at Northern Illinois University. But in the Metro edition, this news story did not make the front page. 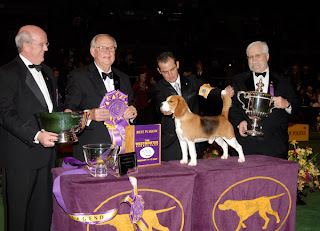 On the other hand, an article about Uno, a beagle from Belleville winning Best in Show at the Westminster Kennel Club on Tuesday made Page 1. Today I ran across Post-Dispatch writer Jo Mannies blog on stltoday.com where she suggested that John McCain "could do worse" than to select Missouri governor Matt Blunt as his running mate. I'm not sure how. Governor Doogie claims that he's not running for reelection because he accomplished what he wanted to accomplish in Jefferson City. I think we all know that he's really quitting because Jay Nixon would have cleaned his clock in November. I give Blunt credit for getting out of the way for a credible candidate. But why would Senator McCain pick a failed Missouri governor as a running mate? The only reason that I could come up with is that McCain actually thinks that if he carries Missouri he might actually win . . . and he has bet on Obama to win the presidency. 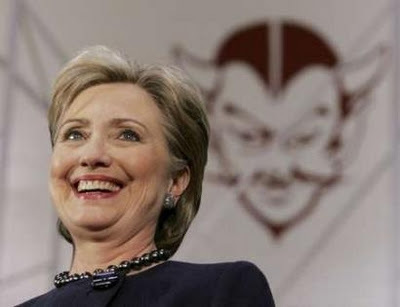 Tonight the Drudge Report claims that some in Hillary Clinton's campaign are acknowledging that it will be difficult for her to catch Barak Obama in the race for the Democratic presidential nomination. First of all, I'll believe it when I see it. I'm not ready to count Clinton out. But let's assume that Hillary's quest to return to the White House (and Bill's quest to return to the Lincoln bedroom) does fail. Should conservatives be happy or sad? I think the answer is both. On the one hand, Hillary Clinton is a true liberal. Her politics are so far left that I cannot imagine any legitimate candidate who would make a worse president. But on the other hand, Obama is the great unknown. He does not have the track record to scrutinize and criticize that Hillary does but what he has done has been far left also. He's the great unknown. Is the unknown who is probably an extreme leftist better than the known extreme leftist? Probably, because at least there is a remote chance that I'm wrong about him. But the Republican party nominee would probably have a better chance against Hillary than Obama. She's a divisive figure who stirs up all kinds of negative emotions. No matter who the nominee is - even if it is Democrat wannabee John McCain - many conservatives would come to the polls just to vote against Hillary. Obama doesn't stir the same emotions. There's no guarantee, however, that Hillary would lose to any Republican running this year so seeing her defeated now may be better than taking the chance that she could win in the general election. And that is the tipping point, with no guarantee of a GOP victory over Clinton this fall, I'll be smiling if and when the day comes that she drops out of or loses the race. Sorry Hillary, anybody but you. With Matt Blunt "having achieved virtually everything he set out to accomplish when he ran for governor," conservatives have hope in the 2008 governor's race. According to an article in The Columbia Tribune, both Republican primary candidates, U.S. Rep. Kenny Hulshof and State Treasurer Sarah Steelman, oppose abortion and the related issues of cloning, embryonic stem cell research and somatic cell nuclear transfer. Both have voiced opposition to Amendment 2 and voted against the measure. Although it appears that there will not be a conservative candidate for president in 2008, at least there is hope for Missouri. McCain Conservative? Jeb says so. In a press release issued by the McCain campaign, former Florida governor Jeb Bush says, "John McCain is a patriot and devoted conservative leader." I wish that was good enough for me. Unfortunately, Jeb, I'm not going to take your word for it. Without getting into Jeb Bush's conservative credentials, let's focus on three key issues from McCain's record: freedom of speech, tax cuts and illegal immigration . . . In 2002, John McCain was the chief sponsor of the so-called "Bipartisan Campaign Finance Reform Act," commonly called "McCain-Feingold." This measure was and is a direct contradiction of the First Amendment to the United States Constitution. It specifically bans advocacy groups from participating in political debate by running television commercials near elections. In 2001 and again in 2003, McCain voted against President Bush's tax cuts. Now, apparently, candidate McCain has changed his mind and favors extending the cuts. Most recently, McCain was a driving force behind the "Comprehensive Immigration Reform Act of 2007." Thankfully, the American people shouted that one down but the bill stood to give amnesty to millions of illegal immigrants. Don't be fooled, John McCain is no conservative, no matter what a president's brother says. As the communist regime in China prepares to host the Olympic games this summer, it won't have to worry about criticism from British athletes. According to The Daily Mail, British athletes are being forced to sign contracts prohibiting criticism of the host government as a condition for participation in the games. Once again, I'm happy and proud that our forefathers sought fit cut ties with England in 1776. Let's hope that U.S. Olympic Committee remembers the First Amendment and that American athletes are brave enough to speak out in China. Charles Lee "Cookie" Thornton shot and killed five people on Thursday night. His actions were cold-blooded, evil and unjustifiable. It was mass murder, pure and simple. I was shocked on Saturday to open up the St. Louis Post-Dispatch and read comments attributed to Ben Gordon of Webster Groves. Gordon said, "To me, Charles Thornton is a hero. He opened a business. He went to court, but the system failed him. . . . We are sorry, we grieve, but (Kirkwood officials) share in this responsibility." The only person who bears responsibility for a madman storming into a city council meeting with guns blazing is the madman himself. Real heros are the men and women in the U.S. Military putting their lives on the line in Iraq and Afghanistan every day. Listen to Harriet Patton, president of the Meacham Park Neighborhood Association, who was quoted by Sylvester Brown, Jr., in his column in today's Post-Dispatch, instead of Ben Gordon. Patton said, "Some people are thinking it's OK to take justice in their own hands. They aren't saying it outright, but they're thinking it. It's not OK."
Apparently Harriet Patton hadn't heard Ben Gordon's comments. But what he said and what others Patton knows are thinking is not in any way OK. Cookie Thornton is not a hero. Yesterday St. Louis was shocked by the horrific murders of five people at a city council meeting in Kirkwood. Our thoughts and prayers are with the families of five public servants, killed by a cowardly madman with a gun, and with two others wounded, one critically. Also yesterday, Emmis Communications announced that KHITS morning drive host J.C. Corcoran would be suspended for two weeks for stating on the air Monday morning that, "I swear, I'm gonna get on top of [Ameren UE's] building with an AK-47 and just start picking people off." Corcoran was mad at the power company because his electricity went off during the Super Bowl. Apparently, Emmis Communications - even after the Kirkwood killings - doesn't believe that threatening to shoot people is serious enough to warrant more than a slap on the wrist. Super Tuesday or Super Tragedy? Super Tuesday resulted in a big win, at least according to the news media, for John McCain in his bid for the presidency. He now has significant momentum and more than half of the delegates needed to wrap up the Republican nomination. Money is sure to follow as elites donate to back the man who they see as the inevitable "winner." Unfortunately for conservatives, McCain is not one of us. He loves to court liberal Democrats and "reach across the aisle" in a "spirit of bipartisanship." What those noble sounding catchphrases really mean are that McCain likes to back Democrats and liberal ideas to boost his personal standing with the Washington elite and members of the media. It amazes me that the GOP seems on the verge of electing John McCain as its standard bearer. 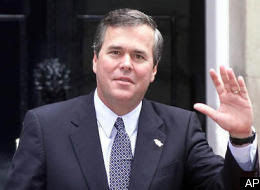 This is the guy who is wrong on taxes, wrong on immigration and wrong on campaign finance "reform." One reason, of course, is that Democrats and so-called independents are voting for McCain in droves in primaries around the country. These folks aren't likely to vote for him in the general election, just like his friends in the media aren't going to support him over Hillary Clinton or Barak Obama, but they love seeing this "moderate" nominated instead of a conservative contender. The time is now, if it isn't already too late, for conservatives to rally around a candidate or candidates to keep McCain from gaining the Republican nomination and "moderating" the GOP right out of relevance and possibly right out of existence. Editor's note: This entry was originally posted on February 6, 2008, before Mitt Romney dropped out of the race. I did some internal housekeeping and changed the name of the blog, requiring a re-posting tonight. It pains me to say that today's developments proved my worry that it might already be too late correct. I wish that I was wrong to worry about what has become reality.